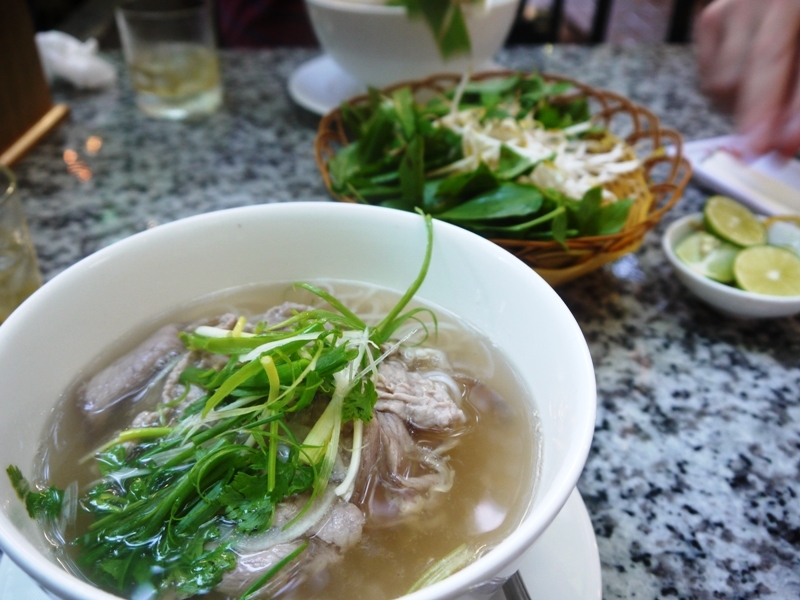 Another visit to Vietnam….when for a walkabout somewhere near Ben Tharn market, and I saw this 1Malaysia stall..
Had dinner at Pho 24, I have tried pho ( beef noodles ) and the broken rice but hadn’t tried the vermicelli noodles (Bun), so I opted for the Bun + spring roll + grilled pork version and for drinks I ordered pamelo juice. I thought this was something soupy but err..it was a dry dish. 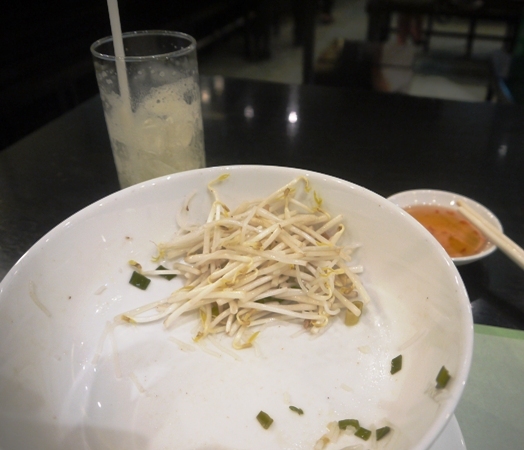 The vermicelli was nesting on top of bean sprouts..oh oh…I am not a fan of raw bean sprouts. 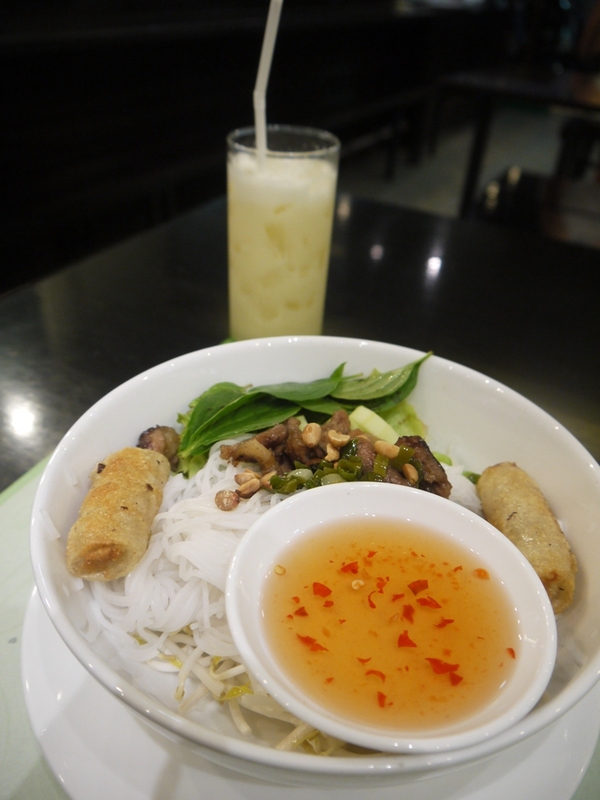 The vermicelli were surprisingly moist yet non sticky and rather pleasant really. 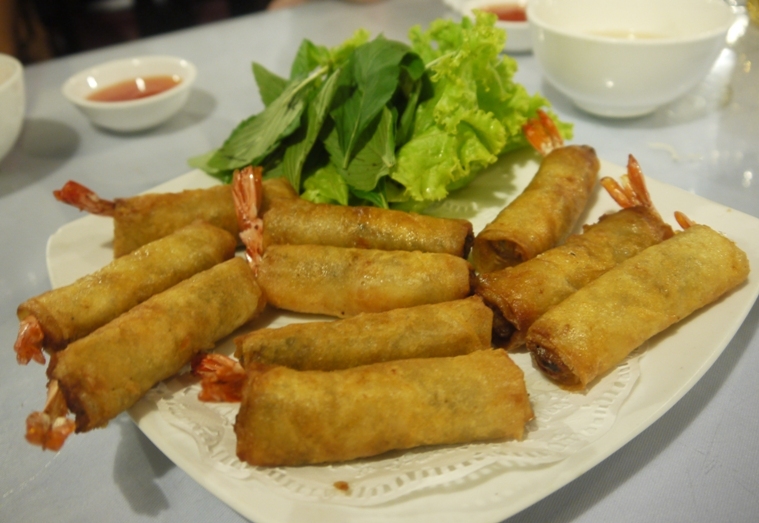 The fried spring roll were tasty and so was the grilled pork. Pamelo juice was perfect as a refreshment. Can I get a refund for the beansprouts ? 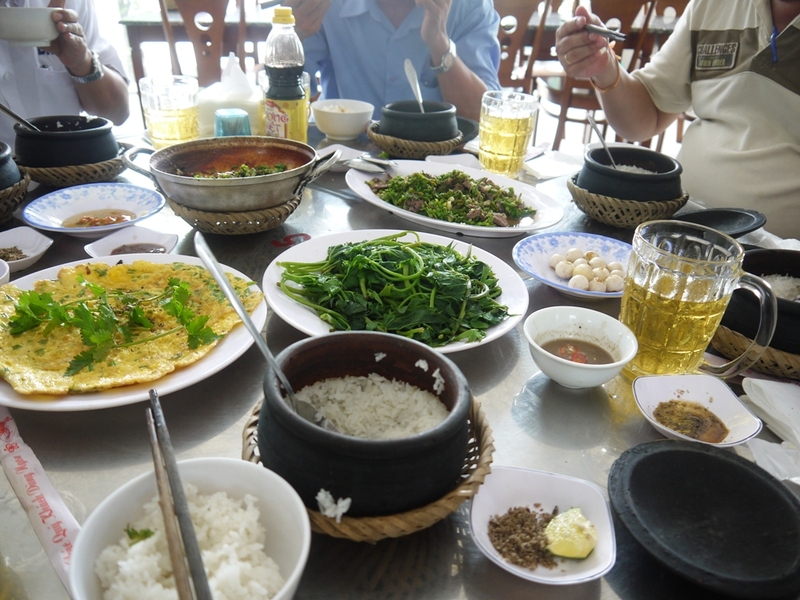 The next day, we traveled to Binh Duong, visit some customers and took them out for lunch. 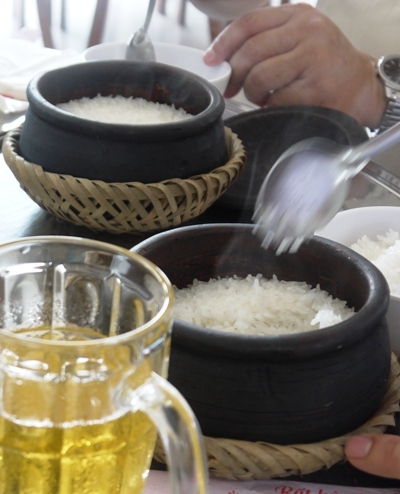 Lunch was at Phuoc Hoa , the place was air-conditioned and the setting was basic but serves its purpose. 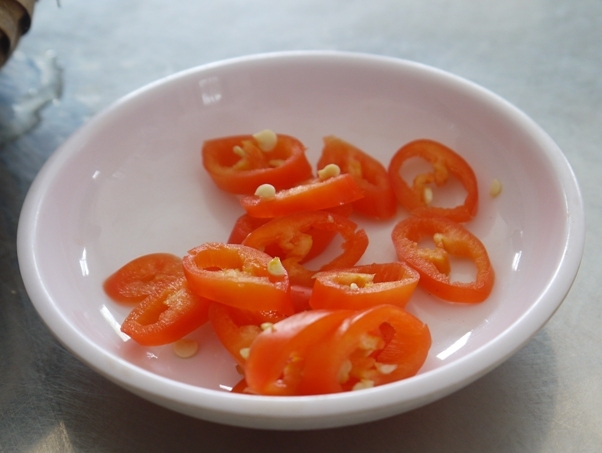 I was told that these red chilies are not as ‘innocent’ as the red chilies we see back home in Malaysia, these packed a fiery kick- i dare not give it a try , chicken ! 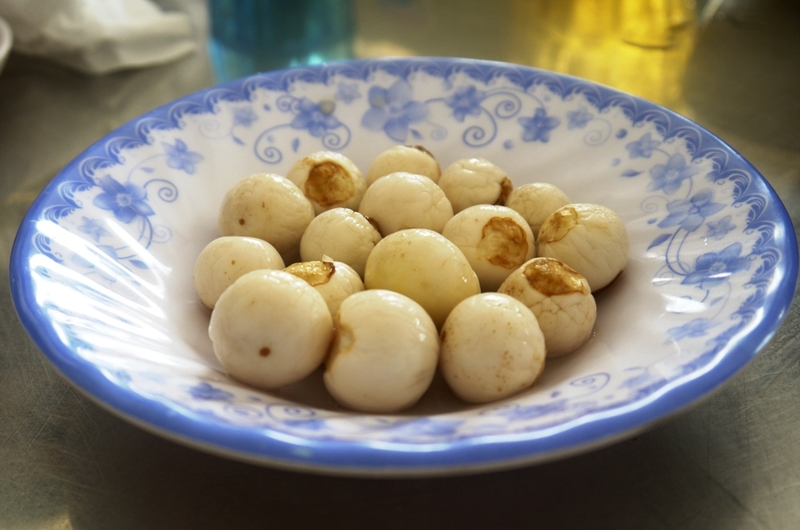 I was asked to guess what these were : I thought i was so pandai and said ‘oh, I know, these are the eggs from the bird (quail)’ and became the object of mirth for those around the table.. these were the small bulb egg plants ! It was crunchy and the texture was graining at the centre when you bite into the seeds. 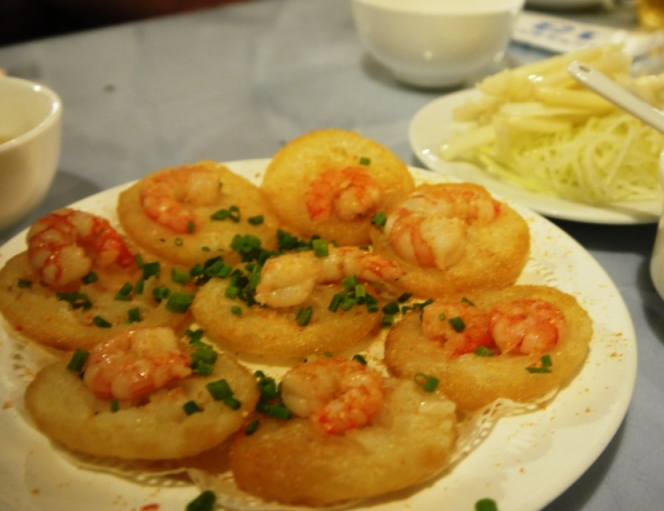 This was slightly salty as they were soaked in salt water. 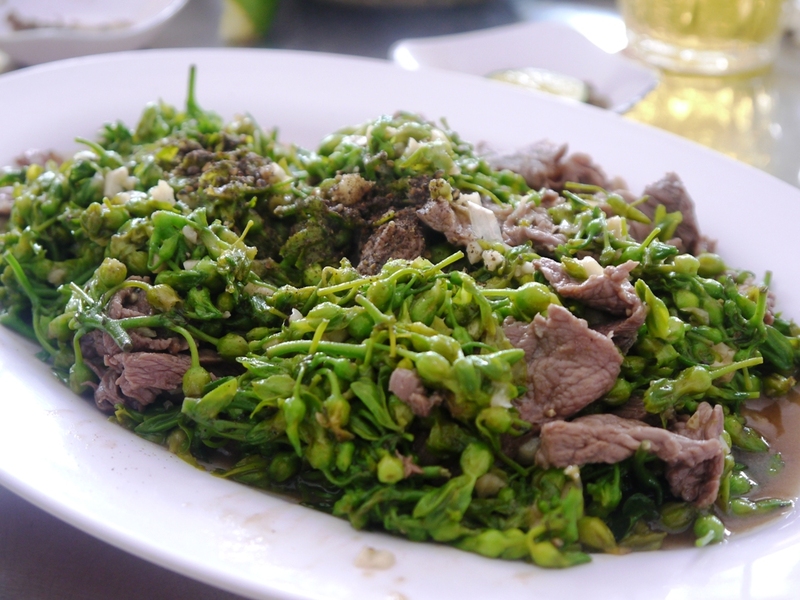 Stir fried beef with some kind of flower buds, the flavour was very light, which gave the flavour of the beef the center stage, the beef was chewy but not tough, this was nice. 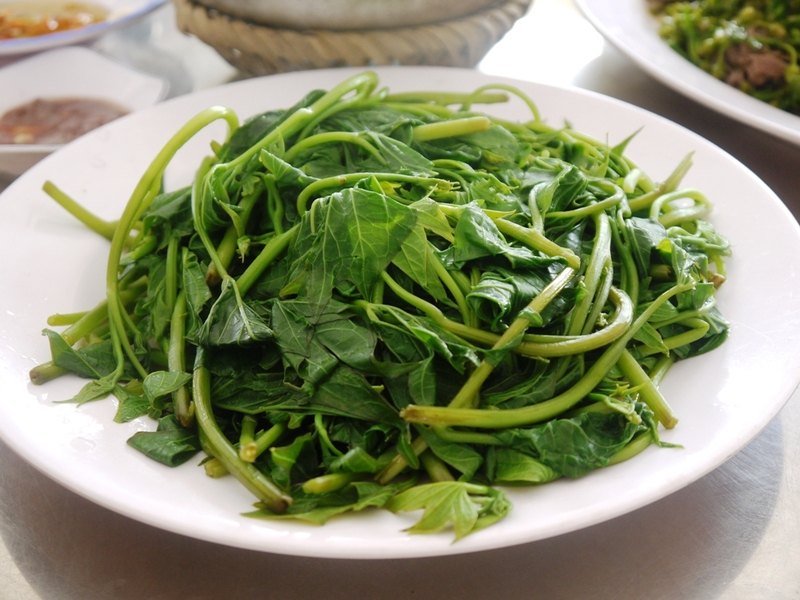 Blanched pumpkin leaves – this was cooked just right, the pumpkin leaves/shoots were tender, the flavour wasn’t overly green. 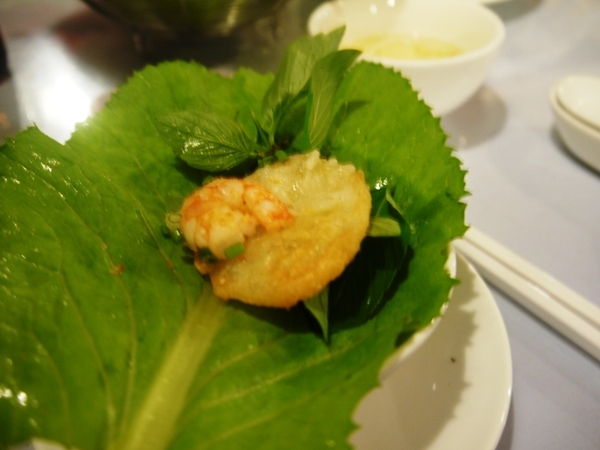 This was usually eaten by dipping in some sauce, but I find the leaves taste well enough on its own. 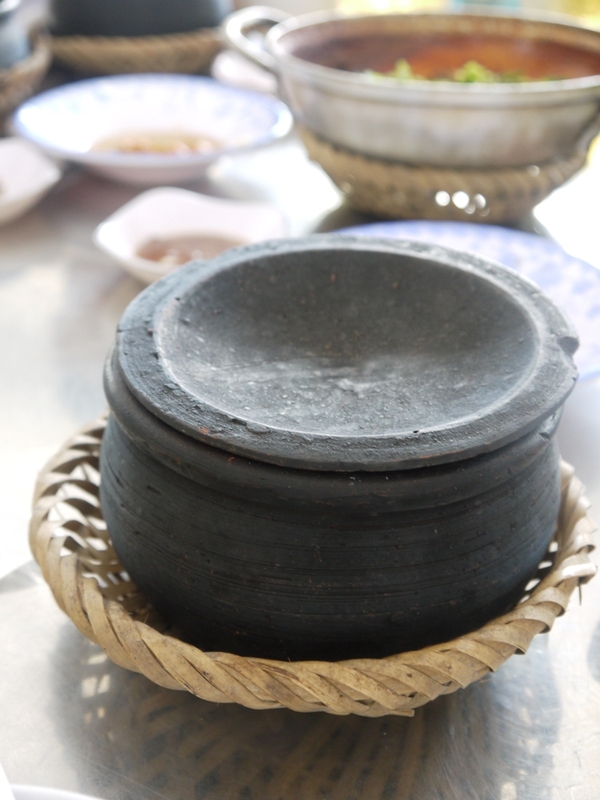 I find that the Vietnamese uses a lot of dips/ sauces, there is almost 1 sauce for each dish. 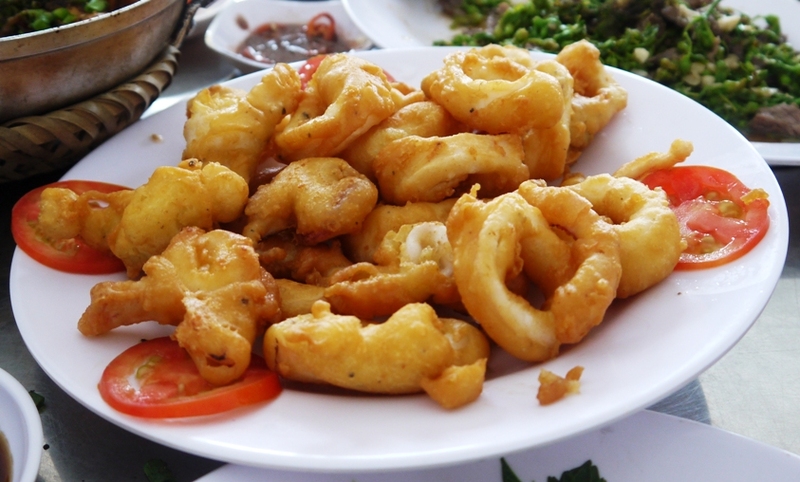 Fried squid rings- the squids were tender and fresh. 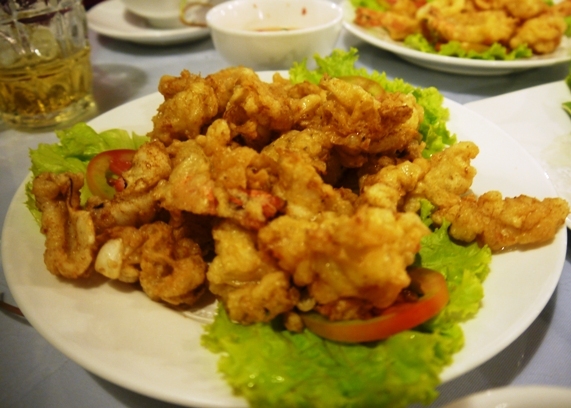 The batter were thin and did not get into the way of squid. 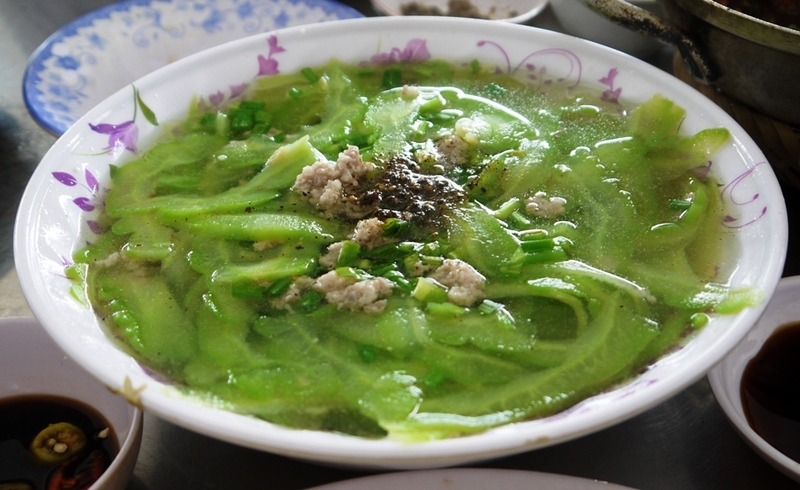 Ah..a joy with each bite..
Bitterguord soup with minced pork – this was a very simple dish and I am not sure what was it but the flavour reminded me of an olden lost flavour that I used to enjoy. 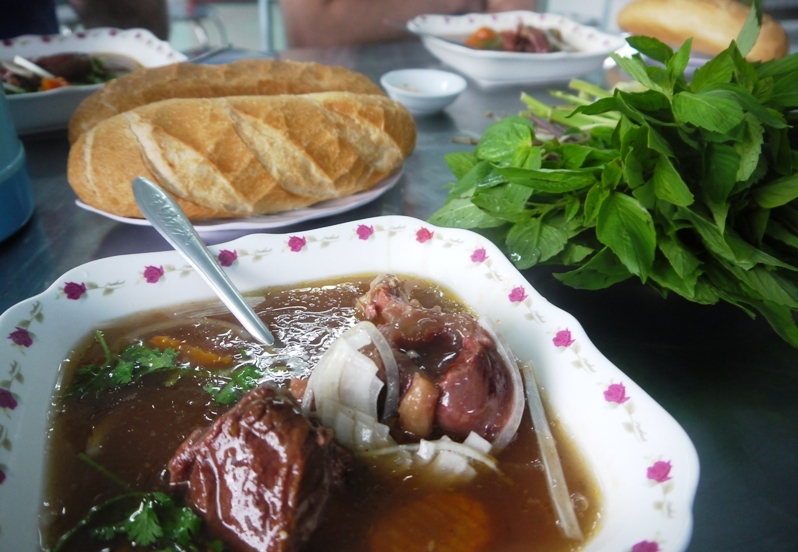 The soup was strongly flavoured with lots of pepper. 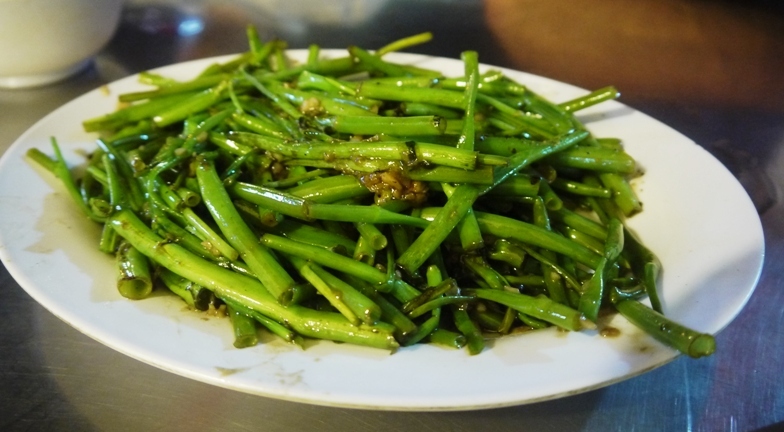 I find the bitter guord slices a bit too green and too crunchy, if this was back home, we would have boiled it until all the slices would have turned soft and yellowish. 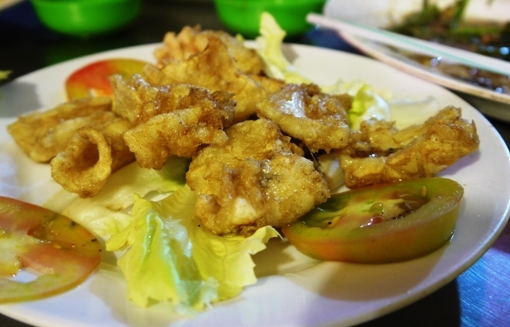 Overall, a simple meal but an enjoyable one. Day 3, same modus operandi as Day 3- we got our 6 a.m pick up to the factory, and before going into the toll station, we stopped at a shop for breakfast. Work work work work….and then it was dinner time…As this was our last night in HCM, our hosts suggested that we moved from Lucky Hotel to stay closer to the city area so that it will be more convenient for us to get to the airport the next day, good idea. 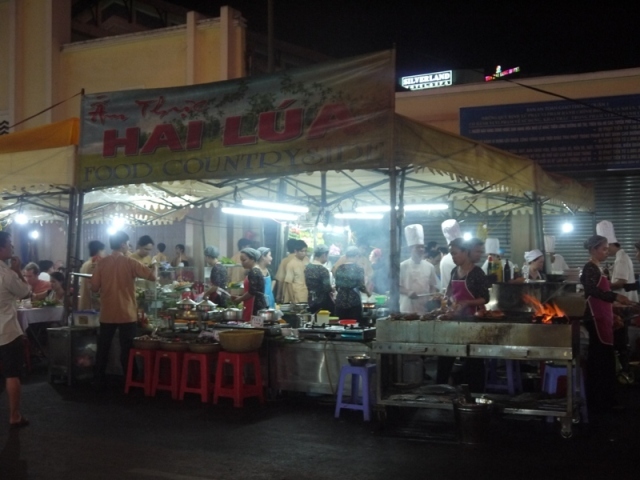 We decide to have dinner at the Ben Tharn night market and was joined later by the expat guy from the factory who took us to his favourite stall and took charge of ordering dinner. 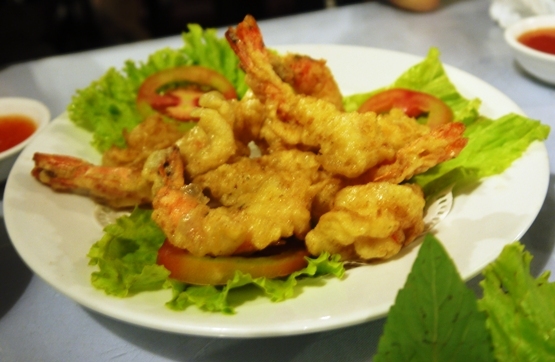 The savior of the day, prawns coiled in potato and deep fried. 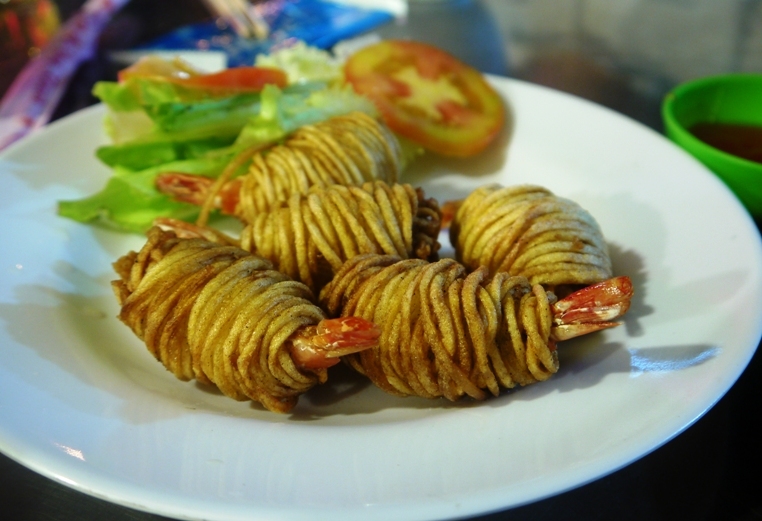 I am still wondering how they achieved getting the potatoes in such find strips and then coiled around the prawns and then deep fried. 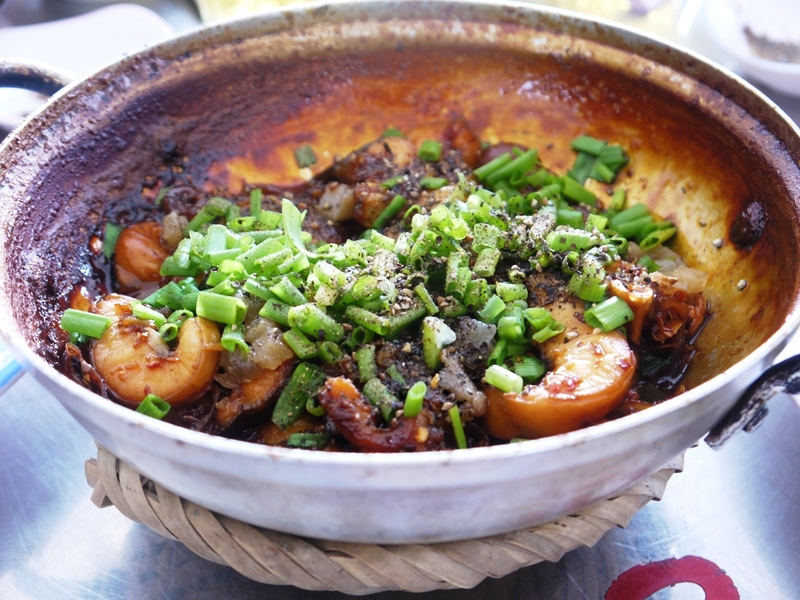 The prawns were fresh and the potato added an interesting taste and texture to the dish. 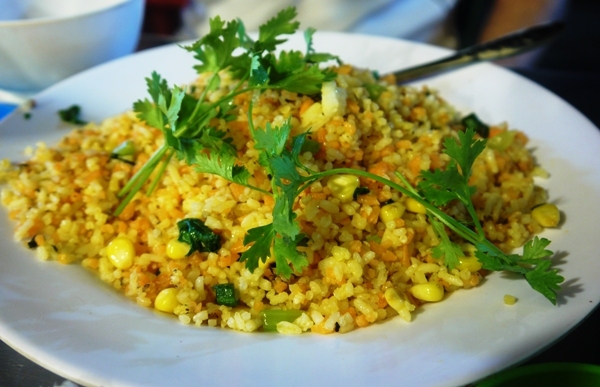 Stir fried kangkong- this tasted of pepper and garlic –and i mean it not in a good way..
Fried rice – this taste like butter fried rice, it was a bit too dry and very bland..
Overall- fantastic beef stew breakfast and a forgetful dinner ! 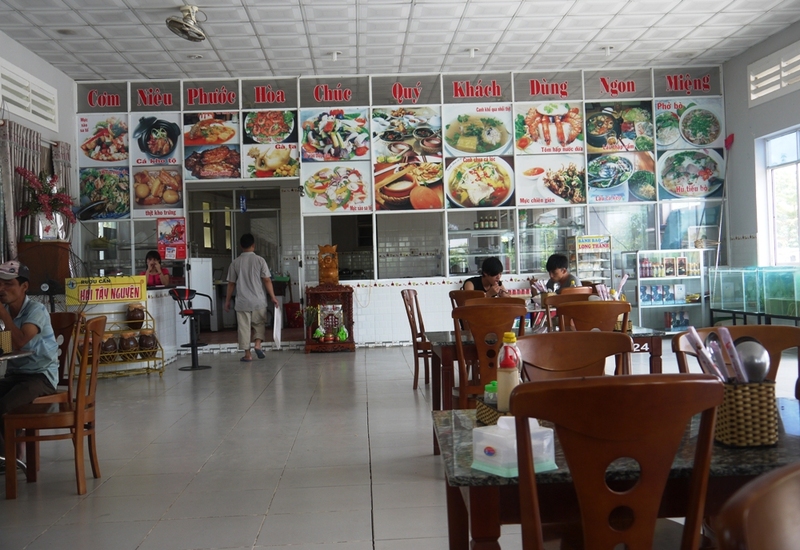 This was one of the food stalls at Ben Tharn …but not the one we had dinner at. The customer that we were visiting start work early, we were picked up from our hotel at 6 a.m ( thank goodness my body was still running on Malaysian time i.e. body clock was at 7 a.m, so it wasn’t too tough to wake up) . We stopped at a busy condo area to pick up another person, while waiting, I spot a lady peddling food by the busy road side. 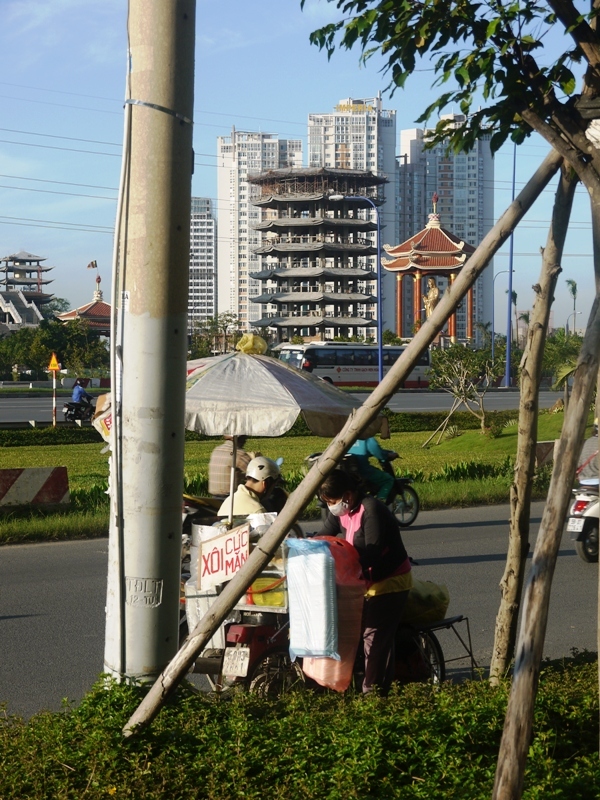 That is what I find interesting about Vietnam, regardless of the wide roads, the tall buildings and the ‘modern’ feel, one could still see street peddlers almost everywhere. 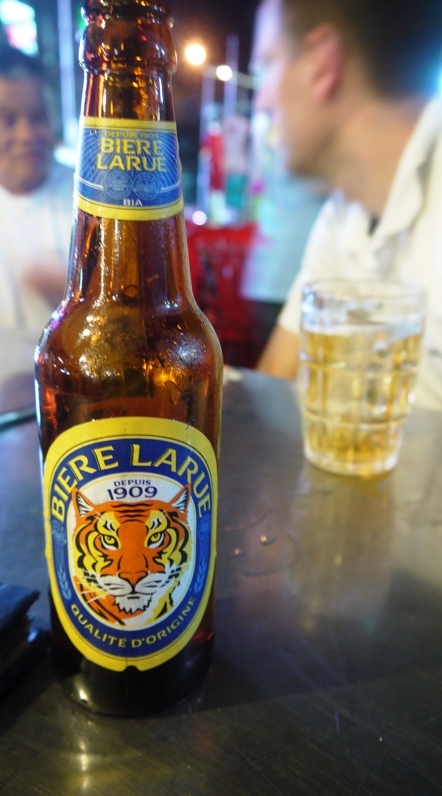 We were served iced tea .. in Vietnam everything seemed to come with ice..including the beers. 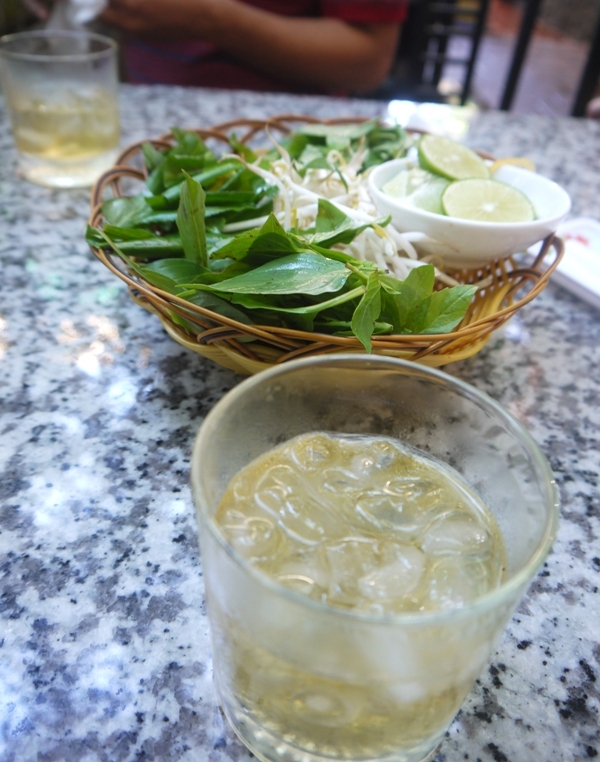 In the picture below, you could see the customary plate/ basket of greens that will go into the noodles that we were about to be served. After that, it was 1 hours’ worth of drive time to the factory, then it was work work work, we had packed lunchbox at the factory, not bad..then work work work….and then it was time for dinner..Yay.. 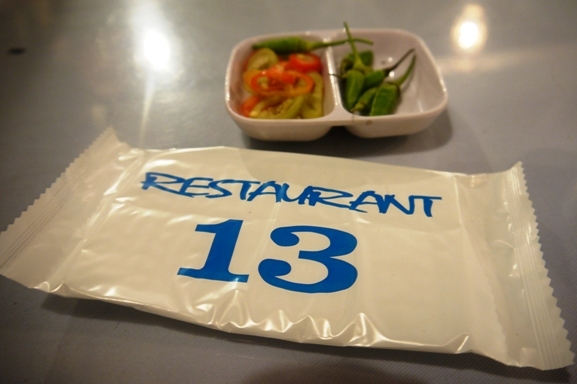 The expat at the factory who has been staying in Vietnam for 1 year plus recommended that we have dinner at Restaurant 13. 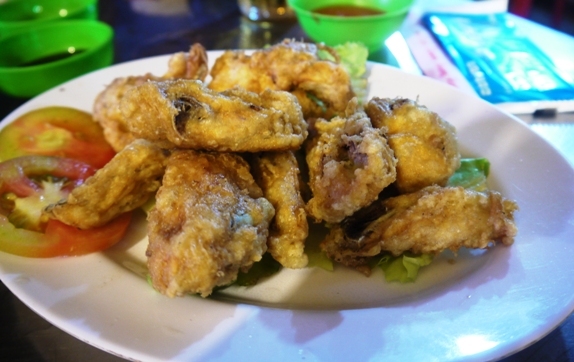 Our hosts did the ordering while I enjoy the night scene..the restaurant was open air and faced the river and it was nice and breezy..
Spring rolls…yummm…as usual — deep fried stuff seldom disappoint ! 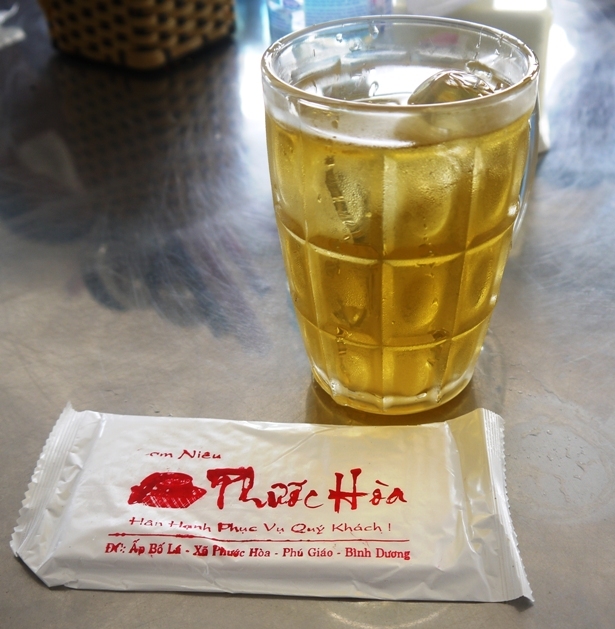 After that the waiter brought a tall stack of white plastic something, I was cracking my head to think what these were for, turned out that they were rice-paper.. sorry I was thinking too long and I forgot to take a picture. And then the ‘standing fish’ was served, everyone Ohhh and Ahhh over the fish..Again, another wrapping process took place, take 1 piece of rice paper, add some unriped starfuit, basil or whatever piece of green that you fancy, then take a chunk of fish meat – then roll ‘em up, dip them in sauce or pungent fish sauce before eating. 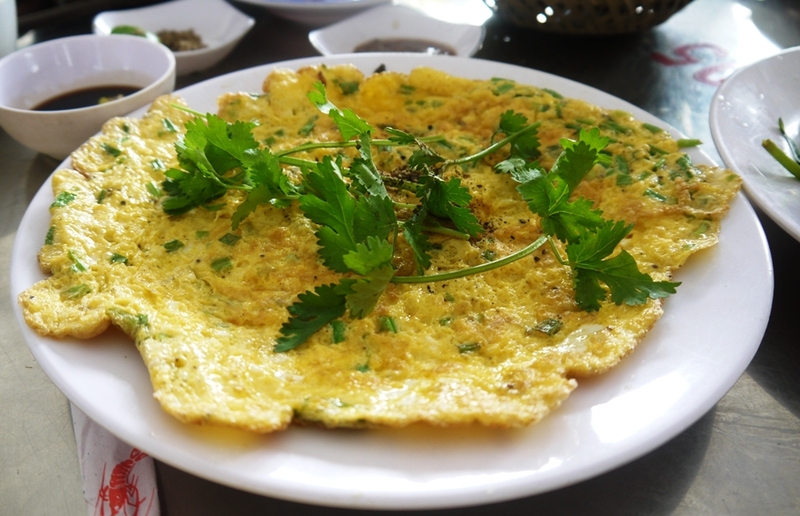 This was interesting, but personally , I find this dish overated , more like a gimmick thing. 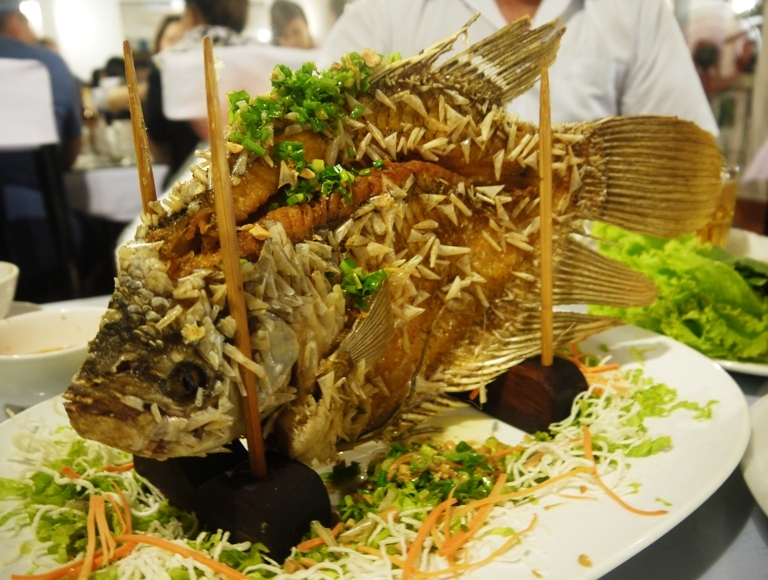 The fish had an earthy smell which is not what I particularly enjoy but luckily this can be masked by the greens. 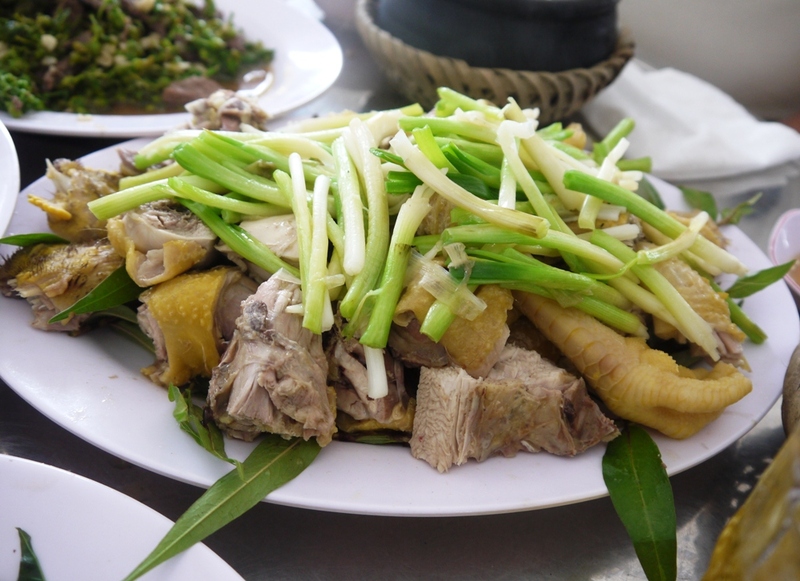 Overall, an interesting meal but taste wise, it was so-so for me. 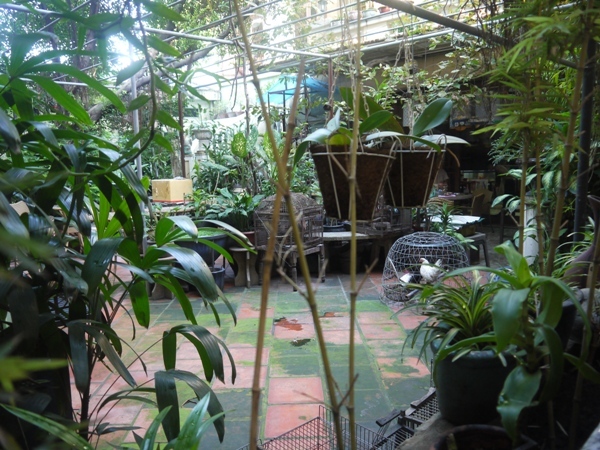 The hosts commented that this was very good and the price was reasonable (I didn’t get to peek at the bill). 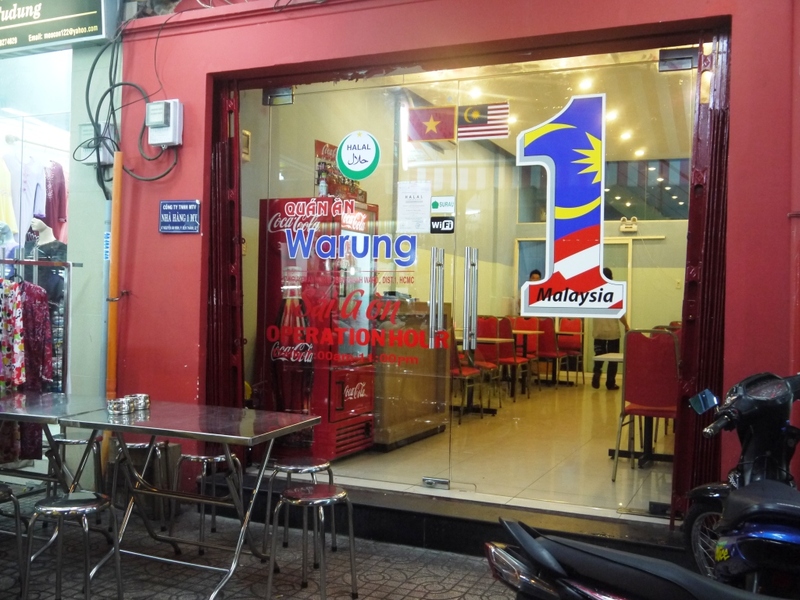 I found out from the WWW that there was another Restaurant 13 closer to the town area, this restaurant was also featured on Lonely Planet.